Do you know that living a successful and productive day requires adopting the right habit? When it comes to achieving outstanding results in our lives, we should learn what to do to wake up refresh and productive each day. And this is exactly what you are going to discover in this article. You will learn the 25 best things to do before bed so that the next day when you wake up, you are ready to kick-start your day. You will feel more productive and more refresh than most ordinary days. While 25 things may seem like a lot to do, you do not have to apply all of them. And the best part is that these 25 things to do can somewhat be incorporated to become our daily habits. Successful people are successful because of what they do, each day, day in and day out. It is their habits that make them successful. Thus, I believe that if you want to wake up productive and refresh every morning, you should start with letting some of your bad habits and adopting positive habits that will bring you the good result you want in life. Starting from your sleeping habits and what you can do before you sleep. If you can wake up each day with full energy, feeling refresh and productive to take on the day, you are half way to accomplishing your goals and reaching your dreams. Most people never pay attention to how they should live their lives. And in the end, they make a lot of money, but they lost their health. These are not good models to follow. What we want here is to achieve an optimum result and living the best life we can. So here are the 25 best things what you can do before bed so that the next morning, you will wake up refresh and productive. This is pretty obvious, and most people think that this tip is nothing special. If you think you, you are wrong. Humans are creatures that live in a pack. We cannot live on an island ourselves. This is why we need to stay connected with people we care. And spending your time with people you love before bed is considered one of the best things you can do. You stay connected with people you care, and you love. You end your day with them. You will feel grateful to have them in your life. Whenever we talk about being productive, there’s no way we can get around with planning. Although that sometimes things will not go according to our plan, we still need to have a plan nonetheless. By envisioning what you want to do and create a plan or a to-do list for the next day, you are preparing yourself for what will be coming before hand. And this is one of the secrets successful people do each night before they sleep. You want to get yourself ready and so that when tomorrow comes, you will know what to do, without having to spend more time to think about it. Studies have shown that it is good to dim down the lights before you sleep. Your body cannot switch from active to the sleeping mood that fast. Thus, the best way to help you get a better sleep is to dim down the light an hour before you sleep. This is why people install a dimmer in their house. Use the dimmer lights wisely. This is another common but effective tip to promote better sleep. Usually, I will switch off my computer and stay away from all electronic devices such as TV, iPad or my mobile phone an hour before I sleep. You want to stay away from devices that will grab your attention and make your eyes tired. Studies have shown that whenever you are using an electronic device, you rev up your brain neurons and make them active. So get unplugged and do not use any electrical devices before you sleep. The lights emitting from the screen will disrupt your sleeping pattern. So what time should you sleep? Some people sleep at 11pm while some people sleep at 1am. And how many hours should you sleep? This is totally depending on your sleeping schedule and habit. If you usually take 8 hours of sleep, you should stick to it. I usually sleep at 12am and wake up at 6am. I sleep 6 hours a day, and I have used to this habit for years. Hence, everyone’s sleep schedule and sleeping time are different. There’s no need for you to compare yourself with others. And in case if you want to change it, change it slowly and little by little. If you change it drastically, it will affect your day, and you will feel tired. For example, if you used to sleep 7 hours a day and you would like to change it to 6 hours a day, do it step by step. You can wake up 15 minutes earlier for a week or two and then improve from there on. Do you know that reading before you sleep has many benefits? One of them is that it can prepare your body for better sleep because reading separates your stresses from daily living. Not only that, reading can train your focus and builds your attention. It is not easy to stay concentrated on reading from words to words. Apart from that, reading reduces your cortisol levels that promote good sleep. Usually, I will read some personal development books before I sleep. You can choose to read books in another category that you love. Have you ever wake up in the morning feeling frustrated because there are just too many things to prepare before you start your day? One very obvious will be your clothes and what to wear. The best is to get yourself ready for what to wear the night before. So that when you wake up, everything is there, and you just need to wear it. Try this and you will see that it saves you a lot of time and make you more productive. You will never have to think about what to wear anymore in the morning. What you can do here is to decide simply that the day has come to an end, and you will let go on whatever problems that you faced during the day. You can continue to work on the problems the next day, but never bring the problems into your sleep. You can also journal and write down what you have gone through. You can write down the problems you need to solve or anything you have to do the next day. When you do this and totally let go the things and go to bed, your subconscious mind will work on the solution while you sleep. This is why people can wake up with solutions out of nowhere after they have completely let go of it. Their minds find a new angle to solve the problem. You should slow down your day at night. Listen to some soft and slow music at night help to promote good and deep sleep. Whenever you slow down your thinking, your mind knows that you are preparing to sleep and the day has come to an end. Researchers have shown that just 45 minutes of soft music will get you to sleep better. You can choose folk, jazz or orchestral music to calm your mind. Usually, morning will be a rush and you don’t have much time to indulge yourself with a long, hot bath. Therefore, you might want to do it before you sleep. When you take a hot bath, you will increase your body temperature. And this will initiate a tired and sleepy feeling. It also slows down your metabolic functions like your breathing, digestion and heart rate. While some people say that taking a hot bath is not working for them and they find it more difficult to sleep after that. Well, everyone’s body is different, you can try this, and if it is not helping, you can ignore it. If you are not adopting this habit, you should do it starting from tonight onward. It is said that going to bed without brushing your teeth is just like sleeping with poop in your mouth, ouch! Just imagine all the food you have taken during the day, and do you want to leave some residuals in your mouth and take them along to sleep in your mouth? I bet you do not want this to happen. So just brush your teeth before you sleep. Make it a habit and you will wake up more refresh the next day. Light exercise before you sleep will give you a better sleep at night. Studies have proved this. However, make sure you only do light exercise and not the heavy ones. And if possible, try not to exercise one or two hours before you sleep. Give your body at least 2 or 3 hours to cool down before your sleep. This tip is best to go along with taking a shower after the light exercise. And the next day when you wake up, you will feel more energetic and productive. Pamper yourself by doing face mask or get a massage from time to time. You want to treat your body good because you need to go through days with a healthy body. Usually after doing a face mask or a massage, you will feel your body becomes lighter and will be in a relaxed state. You can then sleep better in this relax state. What can be more important to do than writing down what you have accomplished during the day or write down what you are grateful for? You want to program yourself for achievement. Thus, you shall remind yourself of all your accomplishment. Not to brag, but to keep the positive energy flowing in you so that the next day, you will set out for accomplishment again. Psychologists have proved that when you go to bed with a grateful and thankful feeling, you will have a more refreshing sleep. You can read it here. When you meditate, you control your breathing pattern. You take in more deep breaths and you manage your thoughts. It is obvious how meditation can make you sleep better and wake up more refresh the next day. You can start to adopt this habit with just 5 minutes a day. And then you can increase it to 10 minutes or more. A small intake of fruits can make you sleep better. However, do not overeat or take in too much, and do not eat fruits the very last minute before you bed. You can do this one or two hours before you sleep. Fruits can be one of the best snacks to eat at night. Just that you have to remember to brush your teeth before you sleep. Another crucial thing you can do before bed is to review your goals. If you want to be productive, you have to keep your mind focus on what you want to achieve in your life. Like what I have mentioned above, when you sleep, your subconscious mind will still be working. Hence, when you review your goals before bed, you will leave your goals to your subconscious to digest. You will program your mind for what you want to accomplish. And this is a very powerful success habit to adopt. Reviewing your goals will be easier if you have a template. 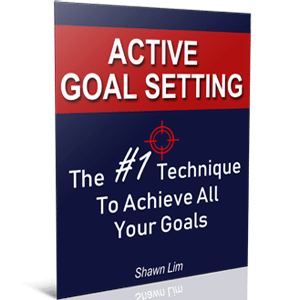 Check out our goal setting templates here. Do I need to say more on this? Just “detox” and let go whatever that is in your body before you get to bed. You do not want to bring whatever that is left in your body throughout the day into your sleep. You can’t sleep well if it is too hot. And you can’t sleep well if it is too cold either. Therefore, make sure your bedroom’s temperature condition is right and suitable to you. Your brain and your body will adjust themselves to suit the temperature in the room. And if it is too cold or too hot, your brain and body will struggle to achieve this. This is why you can’t sleep well when it is too hot or cold. Studies have shown that the optimum temperature for sleeping should be around 18 degree Celsius to 22 degree Celsius. However, you can still adjust according to your suitable temperature. If you are not sleeping in an air-conditioned room, it is better to leave the window slightly open to allow fresh air flowing. And if you are sleeping in an air-conditioned room, you too can choose to do this. It is up to you. You can sleep better with more oxygen air flowing through the room. However, you may want to take into consideration on safety issue and the temperature. If it is too cold outside, you can’t sleep well with your window open. You definitely cannot sleep properly in a noisy environment. If you are a sensitive person, you can wake up due to even the lowest noise. You do not want to get distracted and awake in the middle of the night because of the noise. Some people who live in a busy city may have a greater issue due to the noise level from traffic and so on. Install sound insulation windows if necessary. Sometimes it will be money well spend. Are your bedrooms completely dark and lights-out? Do you notice that most hotels usually use thick and sun out curtains? This is because to promote deep sleep; the environment must be in the dark situation. Lights indicate daytime and your body can never sleep well in such condition. So change your curtains and make sure your room can give you a good sleep. When it comes to mattress and pillows, I will suggest you go for the quality ones. Come on; we sleep almost 6 to 8 hours a day. And sleeping is one of the activities that we do the most each day. So make sure you sleep well. Get a comfortable mattress and pillow. It is alright if you have to spend some money here. It is not like you are going to change your mattress every month. You buy it once, and you will usually use it for years. Trust me; it will be money worth spending. I love my mattress and my memory foam pillow so much. I have never regretted buying them. And I know what it means to have a good sleep with a good bed. Want to wake up productive? Try to declutter and organize your house a little at night before you sleep. When I say declutter, I’m not saying that you should get into the heavy declutter mood and clean up your house for 3 hours. You can also learn to organize your bedroom to promote better sleep here. Why should you pray before sleep? The answer is obvious; you have gone through the day no matter how smooth, or how tough it is and you have reached the end of the day. So you pray that you have gone through a great day and the next day will be even better. You will feel good and wake up refresh the next morning. If you do not want to pray, just say something positive to reinforce your mind that you have gone through a great day and tomorrow will be better. What you do every day is more important than what you do once in a while. To live a successful life and produce an outstanding result, you need to adopt great habits that will support you to get there. And you can start with these 25 things to do before bed. You want to kick-start your day with energy, feeling refresh and with productivity. Thus, make these your habits starting from today. So what do you think is the best thing to do before you sleep? Do you feel refresh and productive the next day? Share with me through the comment section below.